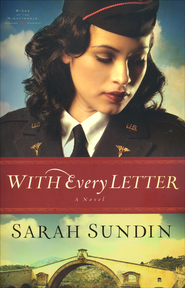 With Every Letter is Book 1 in Sarah Sundin's Wings of Nightingale series. If this book is any indication of how the rest of the series is going to be, I'm so in! Lt. Mellie Blake is a nurse serving in the 802nd Medical Squadron, Air Evacuation, Transport. As part of a morale building program, she reluctantly enters into an anonymous correspondence with Lt. Tom MacGilliver, an officer in the 908th Engineer Aviation Battalion in North Africa. As their letters crisscross the Atlantic, Tom and Mellie develop a unique friendship despite not knowing the other's true identity. When both are transferred to Algeria, the two are poised to meet face to face for the first time. Will they overcome their fears and reveal who they are, or will their future be held hostage to their past? And can they learn to trust God and embrace the gift of love he offers them? I admit that my first impressions of this novel weren't enthusiastic. I thought it started off a little slow. Also, I thought the some of the characters internal issues were a little bit far fetched and trivial. I kept reading however, because I knew Sundin wouldn't disappoint and she didn't. Despite my initial feelings, they changed 1/3 way into the book. The pacing picked up nicely. Also, the character arcs, although they started in a place I didn't enjoy, moved at a believable rate. That's one of the things I love about Sundin's books: her character transformations are very realistic. Instead of the character's having one big Aha! moment, they change gradually and each scene builds another support of that change. I think this technique allows me as the reader to see how the characters actually live out the change they go through. I also love that the epiphany isn't within the last 20 pages of the book. It comes earlier. I really enjoy that. As for historical detail, Sundin is fantastic. She has a gift for transporting me from the present and putting me right in time with the characters. No glaring historical problems in her books. I also loved that the movie, The Shop Around the Corner, is a part of the book (You've God Mail is the modern day adaption and I LOVE that movie).